In the summer of 2014, ISIL forces pushed Peshmerga forces from key areas in Nineveh province, Iraq, threatening the government seat of the Kurdistan Regional Government (KRG) in Erbil and capturing Mosul. Pressure to respond to a growing humanitarian crisis, fueled by media coverage of Sinjar’s Yazidis fleeing ISIL violence, led to calls for an international response that included US and allied bombing of ISIL positions. ISIL mitigated the effects of bombing by building a sophisticated network of tunnels that connected key buildings. ISIL used marksmen, snipers, ambushes, improvised explosive devices (IEDs), and suicide bombers to slow the Kurdish advance, but eventually conserved most of its force by exfiltrating the area and not engaging in a decisive battle. In November 2015, an alliance of Kurdish factions resulted in recapturing ISIL-held territory in Nineveh province—including Sinjar, which sits on ISIL’s Highway 47 supply route connecting ISIL-held Raqqa, Syria, and Mosul Iraq. While successful in Sinjar, the alliance of the KRG’s Peshmerga, Kurdistan Worker’s Party (PKK), the Syrian Popular Protection Unit (YPG), and Yazidi militias (YBS) is fraught with ISIL-exploitable fault lines. 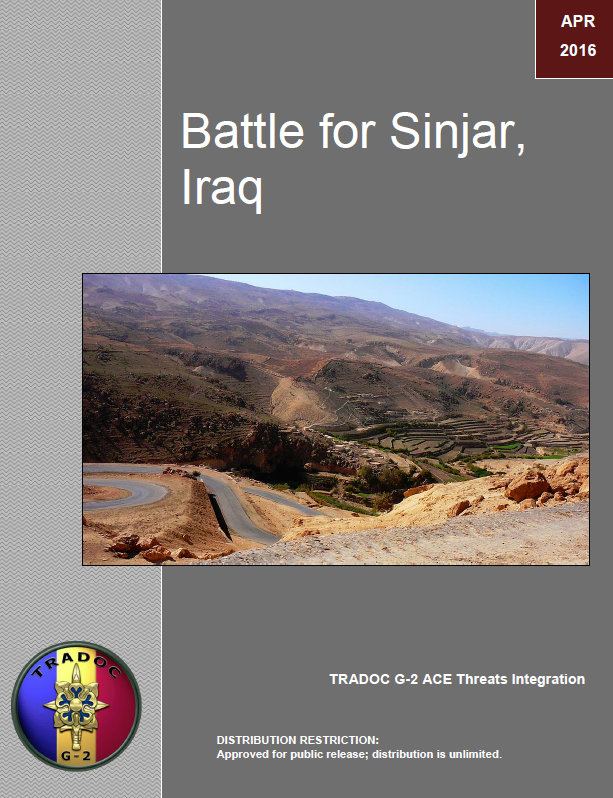 This Tactical Action Report (TAR) provides information on the capture and subsequent recapture of Sinjar, a town at the foot of the Sinjar Mountains. The Nineveh Offensive, of which Sinjar was a key target, led to the capture of a large part of northern Iraq and included the occupation of Mosul. ISIL pushed Peshmerga forces from the area and threatened Erbil, the government seat of the KRG in 2014. A growing humanitarian crisis developed as ISIL began purging villages in the Sinjar area of the minority group known as Yazidis. Thousands were killed, kidnapped, or forced to flee their homes. Many Yazidis retreated to the Sinjar Mountains where they were besieged by ISIL fighters. These circumstances led to President Barack Obama ordering air strikes to protect Erbil, where US military advisors were headquartered, and to relieve the displaced Yazidi civilians. Over a year later Peshmerga fighters, with the help of other Kurdish factions, pushed ISIL forces out of Sinjar and other surrounding areas and severed a key supply route connecting ISIL-held Raqqa, Syria, with Mosul, Iraq. Sinjar1 is a strategically-located Iraqi town in northwestern Nineveh province. It lies along a major ISIL east-west supply route that connects Mosul in Iraq with Raqqa in Syria—two important ISIL-held cities. Sinjar is approximately 52 km east of the Syrian border and 117 km west of Mosul. It is positioned at the foot of the Sinjar Mountains, an east-west mountain range rising 1,463 m above the surrounding alluvial steppe plains. Sinjar is populated primarily by a Kurdish religious minority called the Yazidis. The Yazidis are particularly vulnerable to violence and persecution, having been the object of hatred for centuries because of their religious practices. Yazidis are ethnically Kurdish, but their religion combines elements of Islam, ancient Persian Zoroastrianism, and Eastern Mediterranean Mithraism. While Yazidis are monotheists, they believe in a fallen angel who serves as an intermediary between God and man. To Muslims, this intermediary resembles the Quranic devil. Yazidis are, therefore, considered devil worshippers by their Muslim neighbors. With isolated geography and a history of persecution, the Yazidis rarely intermarry and do not accept converts, further distinguishing themselves. In June 2014, ISIL began an offensive in Nineveh province and captured Mosul, the second-largest city in Iraq, that same month. This ISIL victory gave momentum to a push throughout Kurdish Peshmerga-held Nineveh province. 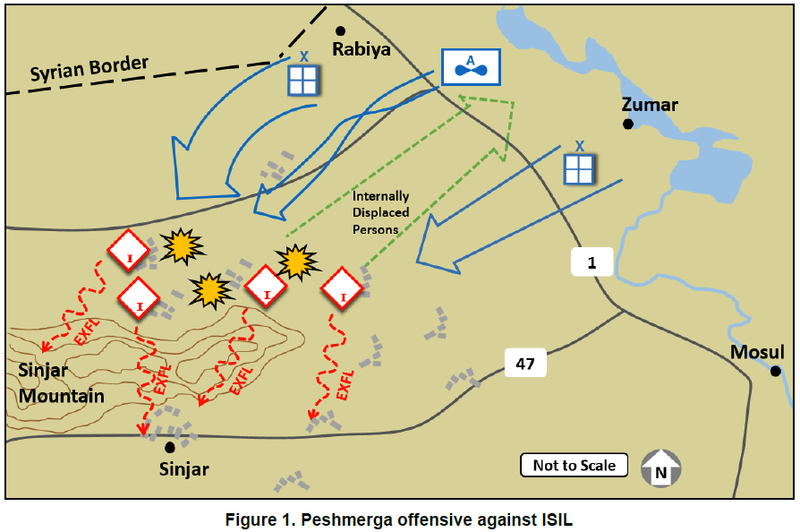 On 1 August 2014, ISIL attacked a Peshmerga unit in the town of Zumar, a small Kurdish-majority outpost 40 km northwest of Mosul. ISIL killed 14 Peshmerga soldiers, while the group sustained 100 casualties and 38 members were taken prisoner in the attack. On 2–3 August, in a serious setback for Kurdish Peshmerga soldiers, ISIL succeeded in taking three strategic towns: Zumar, Wana, and Sinjar. Zumar is an oil-rich area that also lies on a road leading to Syria; Wana is a town on the Tigris river within striking distance of the Mosul dam; and Sinjar is a town on a major supply line that connects ISIL-held Mosul in Iraq with ISIL-held Raqqa in Syria. The towns form a triangle west from Mosul to the borders of Syria and Turkey. The capture of these towns gave ISIL both momentum and proximity to seriously threaten those protecting the Mosul dam, which was temporarily captured and then lost by ISIL between 7–18 August.